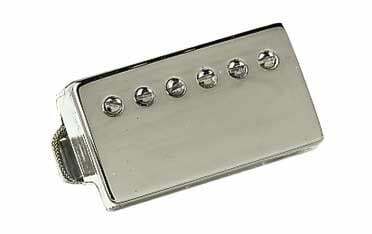 Shop Gibson BurstBucker 2 Replica Humbucker Pickup from AMS with 0% Interest Payment Plans and Free Shipping. BurstBucker™ pickups from Gibson Original Equipment now give guitarists a choice of three replica sounds from Gibson’s original "Patent Applied For" pickups - the pickups that give the ’59 Les Paul Standard its legendary sound. The three BurstBuckers - all with unpolished magnets and non-potted coils, like the originals - represent the variations found among vintage Gibson humbuckers. BurstBucker 1 (IM57A-NH): Slightly underwound, with medium "vintage" output, and works well in both bridge and neck positions. BurstBucker 2 (IM57B-NH): Wound in the range of Gibson’s '57 Classic, with slightly hotter "vintage" output than the BurstBucker 1, and works well in the bridge position with a BurstBucker 1 in the neck position. BurstBucker 3 (IM57C-NH): Slightly overwound, with hotter output, and works well in the bridge position with a BurstBucker 2 in the neck position. The initial demand for Patent Applied For replica pickups came from Japanese collectors, and the BurstBucker was offered exclusively in Japan beginning in 1996. By 1999 word has spread of the unique replica tones produced by BurstBuckers. Gibson USA put the first BurstBuckers on a production model with the Gary Moore Signature Les Paul in the Summer of 2000, and Gibson’s Custom division then equipped the Class 5 Les Paul, Custom Authentic '68 Les Paul Custom and Custom Authentic '58 Les Paul Standard models with BurstBuckers. The variations in pickup output and tone came from inconsistencies in winding the bobbins, a result of the lack of automatic shutoffs on Gibson's winding machines in the late 1950s. Seth Lover, who invented the humbucker, always said they wound the bobbins "until they were full", and original examples suggest that employees stopped the winding machines after the counter reached approximately 5000 turns. When the two coils in a pickup have a different number of turns, that variation puts a little "edge" or "bite" on the classic humbucker sound. That's the sound BurstBuckers replicate. (The "creamy" sound that Gibson's '57 Classics replicate comes from equal coil windings.) Gibson then carries the replication process two steps farther, with unpolished Alnico II magnets and no wax-potting of the coils, just like the originals. All Gibson Pickups incorporate superior construction for the absolute peak in performance, even under the most punishing conditions. When you discover how well-made Gibson pickups are, you’ll appreciate their value and they bear the Gibson name. That’s why they’re the choice of top professionals around the world! Gaps between the pole pieces and unit baseplates of a pickup are sources for sound penetration. This can create unwanted feedback that makes pickups “squeal” when used to overdrive amps. The fit between all Gibson Pickup pole pieces and base plates is tight with absolutely no gaps. Gibson threads the pole pieces through the base plate, which eliminates sound penetration in addition to increasing the structural integrity of the unit. Gibson magnetizes our own magnets to ensure the total reliability of each magnet’s performance. Critical magnetic flux is maintained for the perfect combination of output without sacrificing tonal characteristics. The pole shoe is a critical component in a pickup. It is positioned between the coil forms and the unit base plate in order to provide support and guide the pole pieces through to the threaded slots. This hand machined manufacturing process is identical to the original methods used during the fifties for Gibson Pickup production. Most pole shoes are stamped and can deform during production. Gibson’s machined pole shoes fit snugly in the pickup. A better fitting pole shoe will not vibrate and reduces microphonic effects. Maple spacers adhere and form to the metal unit base plate and to the coil form when they are compressed in pickup final assembly. They provide additional support for the coil forms and reduce unit vibrations that can cause unwanted microphonic feedback. The standard German Silver cover with nickel, chrome or 24K gold plating provides additional strength and durability, yet is more sonically transparent than other materials that are used (such as brass). That means less high-end loss. The optional 24K gold plated cover will last longer and not rub off as do other less expensive gold plating options. The ’57 Classic, ’57 Classic Plus, P-90, P-100 and Mini- Humbuckers feature vintage style two-conductor leads, while all other models feature four-conductor leads for all wiring variations such as series, parallel or split-coil operation. Every Gibson pickup is potted in a special wax bath to insure that microphonic feedback due to internal vibration is eliminated. All covered models receive a second wax bath to further protect the pickup. installed in my 2005 LP Std with BB 1.